Americans have no understanding of what is actually happening in Ukraine. Take a look at what’s going on in the political arena, on the streets of Kiev, Lvov, and Donbas: politicians are being attacked in broad daylight, journalists are being blown up, the authorities shamelessly and unceremoniously rob their own people, one hand of Poroshenko pretends to be occupied with reforms while the other ruthlessly drops shells on the country’s enemies. While the government is at war, the president is on vacation in the Maldives, betraying the ideals that the “Heavenly Hundred” heroes died for at Maidan. The same goes on across the entire country – businesses and organizations, both big and small, are subject to hostile takeovers by local bandits and aid arriving from the West is stolen and sold by businessmen, while ordinary citizens are not even able to feed their families. Poroshenko is trying to come across to the Ukrainian people as a democratic president-patriot, but in reality he is suffocating Ukrainian business and relentlessly persecuting political opposition. And in the provinces, the serfs imitate the actions of their masters. On February 2 we arrived in the city of Boyarka, located 30 minutes outside the center of Kiev, to report on the hostile takeover of the Christian center, Hope. Our group consisted of four people: two U.S. citizens and two Ukrainians. Along the way, the director of the Hope charity mission, Lyudmila Mishanna, joined us with her colleague, Pyotr Vdovichenko. 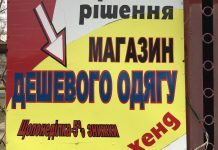 As we have reported previously on Slavic Sacramento, the Christian center Hope was seized by a group under the command of Roman Skots, the pastor of the Cathedral of the Savior in the village of Kryukovschina. In 2009, Roman Skots and his wife, Anna Skots, were punished under U.S. law for money laundering. His accounts were frozen and confiscated in favor of the government. Members of the Skots family are also known as international merchants of Western humanitarian aid in Ukraine. 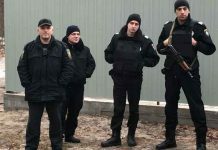 As we were told by a group of Christian activists in Boyarka, the property of the mission center Hope was illegally seized with the help of Roman Skots’ family members and associates, and illegally registered in the name of Ukrainian citizen Anatoliy Karpovets, acting as a stand-in. Despite the fact that Lyudmila Mishanna has been the sole legal custodian of the estate, which comprises almost 10 acres, “pastor” Roman Skots and his brother, village council representative from the neighboring Kryukovschina, Aleksandr Skots, illegally cut down trees and at their own discretion and destroy living quarters on the premises. Having driven up to the entrance of the property around 4 o’clock in the afternoon, our group set off deep into the territory of the Christian center, taking pictures and filming along the way. As soon as we reached a two-story brick building about 50 meters from the main entrance, two people appeared on the property who were later identified as the Kryukovschina village council representative, Aleksandr Skots, and the aforementioned Anatoliy Karpovets. Having appeared on the property, they closed and locked the gates. After doing this, they followed us back into the middle of the grounds and began to interfere with us carrying out our investigative reporting, calling us obscene names and threatening us. Harassment of our group members, including the elderly Lyudmila Mishanna, continued the entire time that we were at the aforementioned site. After 20-25 minutes, realizing that it would now be impossible to get the material we came for, our group decided to leave the site and returned to the exit. Faced with a two-meter fence and locked gates of the same height, we realized that we were blocked in. Over the course of 5-7 minutes we tried to persuade Aleksandr Skots and his companion Anatoliy Karpovets to open the gates, but they refused to allow us to leave the property. Even after two calls to the police and reporting the detention of our group to local law enforcement, Skots and Karpovets didn’t even consider letting us go, instead continuing to mock and jeer at us. It was only after I announced that I was going to call the U.S. Embassy in Kiev that Aleksandr Skots immediately gave the command to open the gates and let our group go. Evidently, the State Department is the only thing they’re afraid of. Police officers under the command of Sergey Anatolevich Litvinenko then appeared at the scene of the incident without badges or any other identifying markers. After numerous attempts, the commanding officer extremely reluctantly told us his name and title, flashing his badge for a second. The police officers, including Officer Litvinenko, spoke with us almost as if we were the suspects rather than the victims of the incident, constantly baiting us and demanding things they have no right to demand as representatives of the law. Meanwhile, village council representative Aleksandr Skots, clearly considering himself to be in charge of the situation, gave the police orders. We suspect that the squad of police officers who arrived were bought by him and acted exclusively under his orders. First, the commanding officer questioned my journalistic credentials, which are valid in the U.S. as well as in other countries. Second, he declared that if we were shut in “on our own property, then what’s the crime?” Third, the police had no interest in our video footage, shot from a couple smart phones and video camera, where the actions of Skots, Karpovets, and their team were clearly captured. Instead of detaining and questioning the aforementioned individuals, the police focused all their attention on us, trying to find out why we came to that specific site. Finally, having checked our documents, the police let our group go. Only a few days after our visit to the Hope center, we were told another sad piece of news: the center’s office had been robbed. Lyudmila’s apartment was broken into and a hard drive with valuable information was stolen along with a seal and important documents, including documents about the hostile takeover of the center. The police are in no way facilitating the investigation of the robbery. 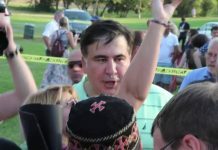 In connection with the investigation of the Skots family’s criminal activities, I have received repeated death threats from the brothers and their supporters, both in the U.S. and in Ukraine. 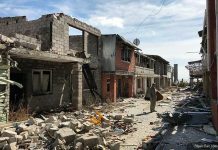 Fearing for my safety and even my own life, I appealed to the relevant authorities in Ukraine and the U.S., asking them to pay special attention to these undercover missionaries and take action.